What is a ray? What is a skate? Rays and skates are dorsoventrally flattened fish that are closely related to sharks. 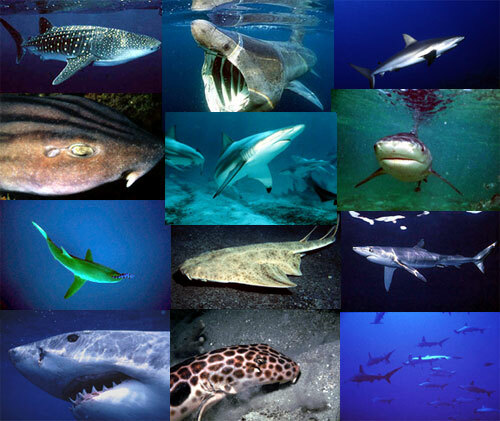 All are considered to be within a closely related group of fish called elasmobranchs. Rays belong to three scientific orders – Pristiformes, Myliobatiformes, and Torpediniformes while skates are classified in the order Rajiformes. Elasmobranchs are a closely related group of fishes, differing from bony fishes by having cartilaginous skeletons and five or more gill slits on each side of the head. In contrast, bony fishes have bony skeletons and a single gill cover. Elasmobranchs include sharks, sawfishes, rays, and skates. How long have rays and skates existed? The fossil record of rays and skates dates back to the Lower Jurassic (150 million years ago). All of the major taxa are known by the Upper Cretaceous (100 million years ago) to the Paleocene (50 million years ago). In contrast to the bony fishes, cartilaginous fishes leave behind little fossil records with the exception of teeth and scales. 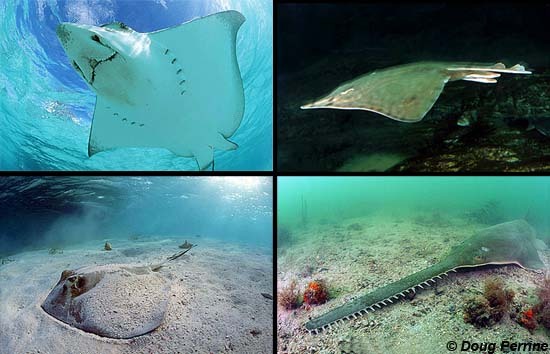 How many species of rays and skates have been described? There are approximately 630 different species of rays and skates that are divided into 18 families when scientifically classified. Are there different types of rays? There are many different types of rays including stingrays, electric rays, butterfly rays, round rays, manta rays, guitarfish, and sawfish. What is an electric ray? There are two families of electric rays, Narcinidae and Torpedinidae. The electric rays are named for their ability to generate and discharge a strong electric current to stun prey and for defense from potential predators. The kidney-shaped electric organs are visible through the skin on the dorsal surface of these animals. Are all rays considered to be stingrays? Stingrays are a type of ray, however not all rays are stingrays as this group also includes electric rays, butterfly rays, round rays, manta rays, guitarfish, and sawfish. Are sawfish related to rays? 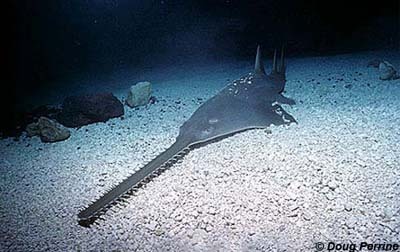 Sawfish are a type of ray. What are the differences between rays and skates? What is the largest ray? What is the largest skate? 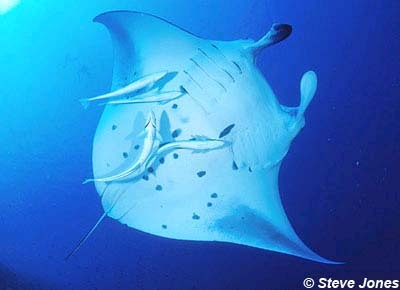 The giant manta ray (Manta birostris) is the largest ray reaching up to 9 meters in width. This ray feeds on plankton and small fish and are completely harmless to humans. The common skate (Dipturus batis) is the largest skate in the world, reaching up to 250 cm in length with a life span of approximately 50 years. What is the smallest ray? What is the smallest skate? The smallest ray is a short-nose electric ray of the genus Narcine, which is only 4 inches (10 cm) across and weighs about 1 pound (0.5 kg). The smallest skate is the starry skate (Raja stellata) which only reaches a maximum total length of 30 inches (76 cm). Are rays and skates related to sharks? Rays, skates, and sharks all belong to the class Chondrichthyes (Greek, chondro meaning cartilage and ichthosmeaning fish). Characteristics of Chondrichthyes include a skeleton made of cartilage, jaws, paired fins, and paired nostrils. The subclass Elasmobranchii includes sharks, rays, and skates. Elasmobranchs are characterized by cylindrical or flattened bodies, five to seven pairs of gill slits, an upper jaw not fused to the cranium, and placoid scales. Placoid scales, also referred to as dermal denticles, have the same structure as a tooth consisting of three layers. These scales are arranged in a regular pattern on sharks and irregular patterns on rays and skates. Is it easy to distinguish rays and skates from sharks? 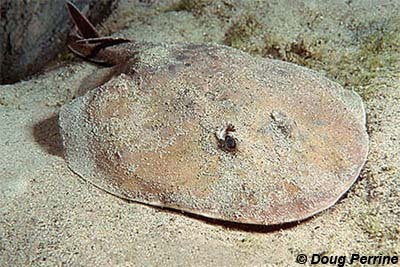 The primary characteristic of dorso-ventrally flattened bodies makes rays and skates easy to distinguish from sharks. Where (in the world) do rays and skates live? Rays and skates live in oceans throughout the world. Most rays and skates are benthic while some are pelagic. Some rays also live in freshwater habitats. In Florida, the Atlantic stingray (Dasyatis sabina) is known to live in freshwater along the St. Johns River waterway as well as inland freshwater lakes. These populations of the Atlantic stingray are unique in that they spend their entire life cycle in freshwater. Are stingrays dangerous to humans? Stingrays have venomous spines along or near the base of the tail. The muscular whip-like tail can be lashed about quickly in defense. Occasionally beach-goers will accidentally step on stingrays that are partially buried in the sand near the beach resulting in a painful, serious wound in the foot. Although the spines are dosed with venom, wounds are not normally lethal. However, it is still important to get medical attention as soon as possible to avoid any potential infection. Electric rays defend themselves with electrical discharge, although these charges are considered dangerous, there have been no reported human fatalities as a result of electric rays. Physicians in ancient Rome prescribed electric discharge from electric rays as a treatment for many illnesses. Are skates dangerous to humans? Skates, which lack stinging spines, are completely harmless to humans and can be handled when necessary without fear. How can humans avoid being stung by stingrays? Humans should do the “stingray shuffle” when walking along sandy bottoms close to the beach. The “stingray shuffle” is performed by sliding or shuffling your feet in the sand. This gives any stingrays in the vicinity enough warning that they are able to swim away. Also, polarized glasses will assist in seeing stingrays in shallow waters. If you catch a stingray on a fishing line, be sure to cut the line and release the animal without handling it to avoid any potential injury. Why do stingrays at public aquariums lack stinging spines? The spines of stingrays are often removed for safety reasons when animals are displayed in aquariums. This is to avoid any potential injury to aquarium personnel during feeding and cleaning activities. Are rays and skates edible? Rays and skates are not considered quality food items for human consumption, however they are captured by artisanal fisheries and by commercial fisheries in the Indo-west Pacific and Europe. The pectoral fins are sometimes marketed as “skate wings” and presumably as scallops (punched from the pectoral fins. Rays and skates are often used in the processing of fish meal as well as laboratory animals.